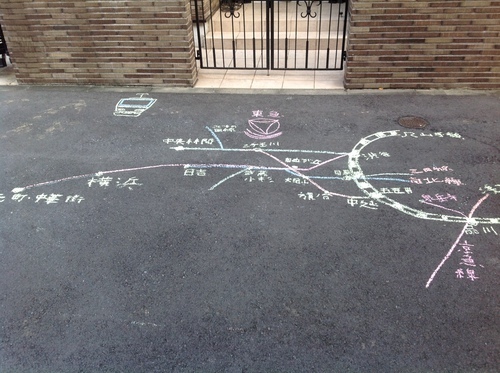 The kids' chalk drawings at this house have gone from Anpanman scribbles to train schematics. Me: We've only got a couple of days left; we should plan to eat at our favorite restaurants and say goodbye to the neighbors we like. Tod: Yeah, we should but we'll come back. Me: Did we go back to Nakameguro? Sendagi? Nishikata? Not really. One of the bittersweet things about leaving this place we've lived so long is saying goodbye to the familiar. Fourteen years is a long time. I've watched the neighbor kids grow up in waves, watched our older neighbors get even older. Witnessed trees mature and bear fruit. Observed the neighborhood change as houses come and go. This place, Kasuga, has been home for a long time. And while I'm very excited to be going to a new home in a green place, I will miss the daily rhythms that I understand so well right here on this block.